Game Insight has announced the launch of its tropical city-builder, Paradise Island 2, on iOS devices. 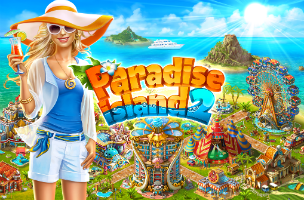 The original Paradise Island has been played by over 50 million players worldwide, and this sequel takes gamers to a new tropical island, where they’ll construct a variety of luxury hotels and entertainment options to attract tourists. Players start with a beach and mostly ruined buildings, and must restore the island and its resort to its former glory. Players are led through Paradise Island 2 by quests, which ask players to construct or upgrade specific buildings, or complete other tasks to make progress. Tourists arrive at the pier automatically over time, and while they must be manually “collected” from the dock, users can typically focus their time on building accommodations to house them (and earn their spending money). Entertainment facilities include ice cream trucks, souvenir stands and more, with additional content unlocked as players level up. As gamers fill their island with attractions, they’ll need to increase the island’s power supply to keep up. In addition, users need staff to complete tasks, so they may need to upgrade their administration building to provide more workers for the island. Land expansions also become available as the resort grows. Buildings like cabins and hotels can be used to host events for tourists to generate more money over time, with some activities taking more time to complete, but also generating more funds. Each building starts with only one available activity, but more can be unlocked as players upgrade them. Upgrades and other tasks take time to complete, but players can speed this up using premium currency. As players complete tasks in bulk, from constructing specific buildings, to helping tourists (by tapping on them and spending some energy), they’ll unlock achievements. These reward users with free and (sometimes) premium currency, depending on the achievement. Eventually, players will unlock the ability to play games with their tourists, like a tile matching game, to earn premium currency and other rewards. For social features, players can login with Facebook to visit their friend’s islands, and, while there, can tap on buildings to earn a few experience points and coins. Paradise Island 2 is available to download for free on the iTunes App Store.